The great thing about period pieces is that you usually get to educate yourself about an interesting part of human history. The problem with The Young Victoria is that there is hardly any learning curve. 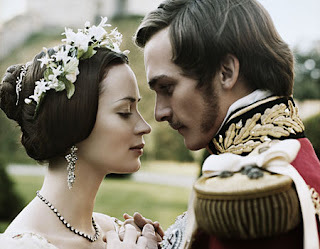 Sure, before seeing the movie, we already knew that she took the throne in the 1830s when she was still a young woman. And we knew there was some sort of minor power struggle to work through in the early days of Victoria's marriage to Prince Albert. And we knew that there was an assassination attempt on the queen, but that she was unharmed and ruled until ripe old age. Emily Blunt and Rupert Friend are both likable and steady in the lead roles, but the story seems to breeze along before it's suddenly gone and done. The movie simply leaves you wanting more, but not in a good way. It's more like it leaves you wanting. The art design, makeup, and costumes were each nominated for 2010 Academy Awards and truly go a long way towards making the movie better than the sum of the script.